There once was a great Storyteller. The people of the land sought him out to hear his amazing stories of adventure, love, comedy, and daring. So great was his skill that he used his stories not only to provide entertainment, but also to teach valuable lessons to his listeners. He traveled the world, telling his stories in each town and city he came to. 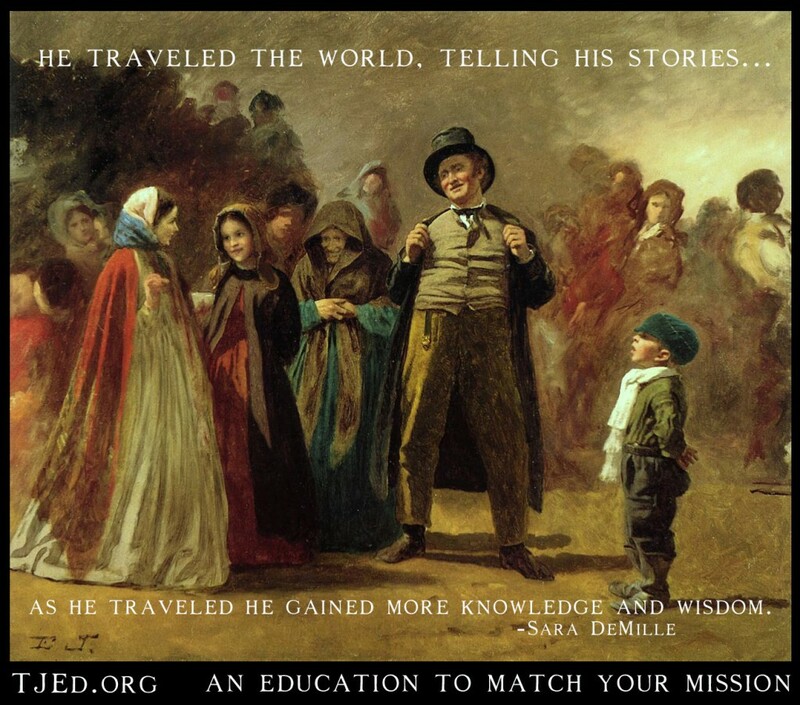 As he traveled he gained more knowledge and wisdom, he created new stories to share these new ideas. After many years of travel he met a young man and took him on as a traveling companion. The young man asked the Storyteller to teach him the art of the story. And so the Storyteller taught him. He spoke of how to create an intriguing story, to capture the audience. He taught him the three kinds of chant, or speech, and when to use them. Plain-chant, the most common form of storytelling, consisted of grand, often exaggerated myths and legends. It would pull the listener deep into the story with its exciting imagery and poetic words. High-chant, like unto a great epic, was long, poetic in form, and set to music, used when telling a story to kings, lords, or other high-class figures. Common-chant was for townsfolk telling stories in everyday conversation, un-stylized and rough, it should be used by a Storyteller rarely and only for a specific purpose. The last thing he taught the young man was the true secret to Storytelling, the thing that made it an art: the ability to mask a lesson within the plot. Many years passed. The young man grew older and the Storyteller’s chapter in this world came to a close. Before he died the Storyteller asked the man who had been his traveling companion and friend to treasure and pass on the wisdom they had shared. The man vowed to do so and carried out his promise by teaching his young son all that the Storyteller had taught him. The son also passed this wisdom down to his children and it became a tradition. As the generation passed the posterity of the once-young man spread across the land, sharing their stories and hidden lessons. As time passed some forgot to weave the lesson into their tale. Slowly the art was lost, until finally the beauty of storytelling was lost in the endeavor to have each story end in “…happily ever after”. From their places afar the Storyteller and his friend wept for their art and for the people who had forgotten its value. They prayed for a resurrection of their dream and a world where people searched for more than happy ending. They waited and wished, but they began to lose hope. All seemed lost; most sought the easiest path and cared not for truth or light. Just before they turned away in despair the Storyteller spotted a new group, small but strong. He watched with elation as they strived for greatness and found the secret of the story. They used what they had found, spreading their stories and wisdom abroad, breathing life into their tales and becoming true Storytellers. 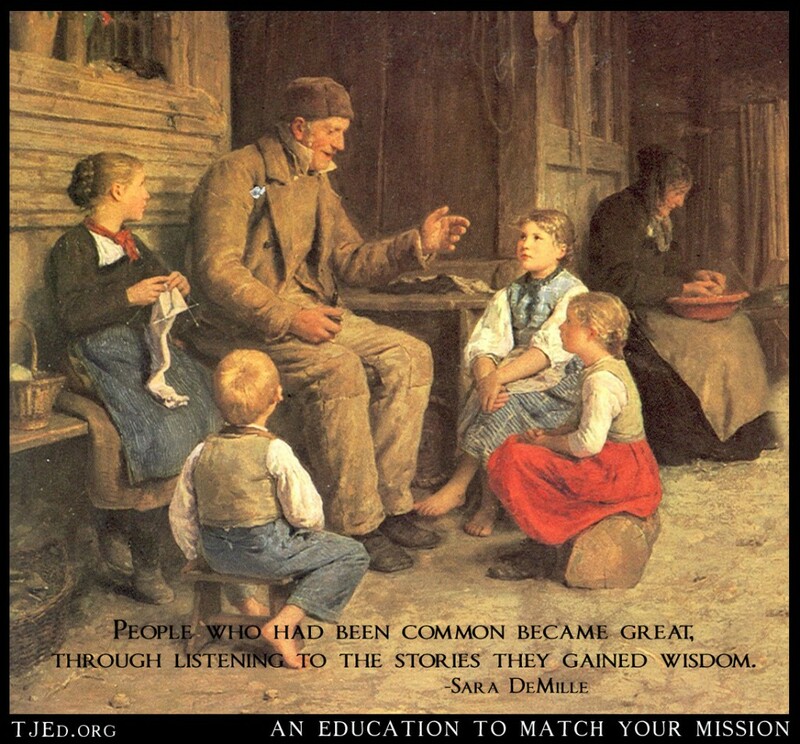 As they told their stories more people learned the art. People who had been common became great; through listening to the stories they gained wisdom. Farmers and blacksmiths became scholars and philosophers. Housewives and gardeners became teachers and leaders. 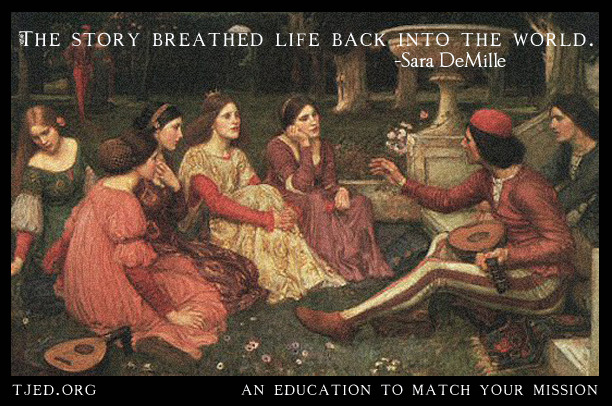 The story breathed life back into the world. *Sara Rachel DeMille is the 20-year-old daughter of Oliver and Rachel DeMille, homeschooled since birth using the TJEd Method. Thank you for this post! I noticed in here you said the Storyteller would mask a lesson in the plot of the story. Perhaps it is a personal preference, but which do you think is better, to tell the audience what the lesson is after the story is finished (or help them discover it), or just give the story hoping as they ponder the lesson will emerge? I Hope it’s not presumptuous of me Natasha, but I found your question intriguing. I don’t think it is so much a matter of personal preference as it is a matter of the context in which it is being told. I believe what makes a great story teller is the ability to determine the appropriate context for how the lesson is discovered. I really like this post, a story about a storyteller! It really does speak of the cycles life takes over time. How important things can be forgotten, and then after time passes a ray of hope comes back. It’s a great parallel to our society right now with freedom being brought back to the forefront of people’s minds after it has seemingly been forgotten or dormant. Also, with great education through the classics becoming more sought after! Well written, thank you for provoking great thoughts!